Asher Meza is not against Jews in Virginia legally arming themselves. He said that many Jews in Israel carry weapons for protection. 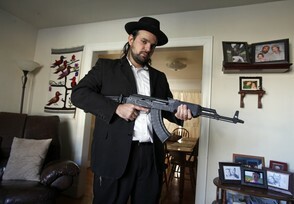 RICHMOND - While a rabbi prayed in a Richmond synagogue, a group of Orthodox Jews passed around an AK-47 before a ceremony celebrating the end of the Sabbath. He found it disrespectful. "It was a lack of proper synagogue decorum during the prayers," he said. When Meza posted the video, Kolakowski asked him to take it down. Meza, a computer programmer, initially refused. But then one of the synagogues where Kolakowski worships, the Rudlin Torah Academy boarding school, asked him not to return for a while, because school leaders were uncomfortable with the video, which got about 2,000 hits in five days. After that, Meza made the YouTube video private. Meza moved to Richmond in 2009 to work with Kolakowski at Kol Emes. Soon after he arrived, Kolakowski was dismissed. He later founded a Hasidic institute to grow the community, and they worship together and minister to students at Virginia Commonwealth University. Meza is not Hasidic. Meza is developing an online ministry through Facebook and nine websites he maintains, including the Spanish serjudio.org, as well as BeJewish.org and GunsandFaith.com. He is the son of Colombian immigrants who grew up in Miami. He studied to be a rabbi in Israel and then moved to Henrico with his wife and daughter. Next month, he is moving to New York to be part of a larger Jewish community. He said his video warns Jews to take precautions because "being religious has become synonymous with being weak." "In this day and age, with all the Jew hatred going around, there is no reason why a (Jew) should not pack heat on Shabbos," he said in another YouTube video he made in December. Meza shows off 10 guns, loading and unloading them and pointing them at the camera. Quoting the late Rabbi Meir Kahane, founder of the Jewish Defense League, he says "Every Jew a .22." then adds, "Perhaps we could do with a little bit more power." He then implores video watchers to "go to your local gun store and start packing." גדולי ישראל נגד "כליפא שמלצר"